Of all the salads I've tried, I think this is The Best Kale Salad. It's loaded with crispy bacon, toasted pecans, sweet tomatoes, and creamy avocado and Boursin cheese. There are also some caramelized onions in here, which might sound a bit strange, but taste incredible. You will LOVE it! I feel like I need to start by telling you that I really do believe that the title of this post is justified. I know that ‘the best' is a little out there. Boastful even. The thing is that at least a few times a week my dinner consists of a giant salad, 99.99% of the time a kale salad. And of the 1.24 billion (ish) kale salads that I've made, this one is, without any doubt, the best I've made. It still holds that status even when I add in all the kale salads I've ordered in restaurants. I'm starting to think kale might play too big a role in my life. Or not. Can that even be a thing? The first time I made this it was really a ‘throw everything that's in the fridge into the salad bowl' kinda dinner. It rocked my world. Even the handsome man said it was the best salad he's ever had. I've made it a few times since and loved it each time. 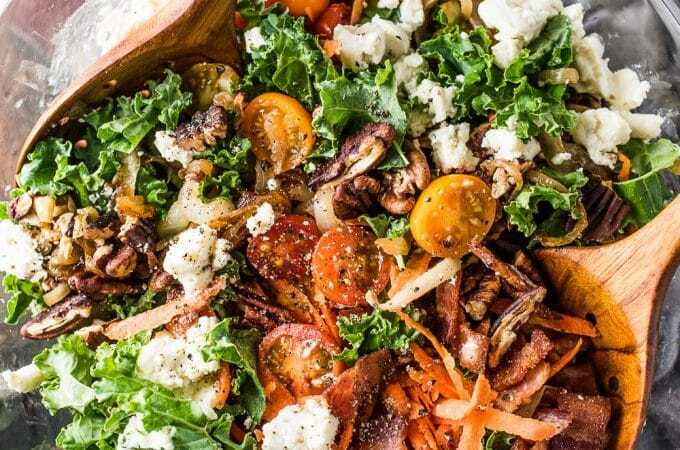 There's creamy avocado, salty bacon, crunchy toasted pecans, bitter chewy kale, sweet dressing and caramelized onions and tart tomatoes. I think my favorite part is how the avocado coats everything in an almost cheese-like creaminess. And the caramelized onions. The sweet, delicious caramelized onions. Or wait. What am I talking about? My favorite part is obviously the bacon. Bacon. I'd love to hear what you guys think of the salad if you make it. I know ‘the best' is highly personal and my fingers are crossed that you and I have similar tastes. I'm thinking that if it's not your first time here then there's a good possibility that we like at least some of the same things. Hope you love it as much as I do! 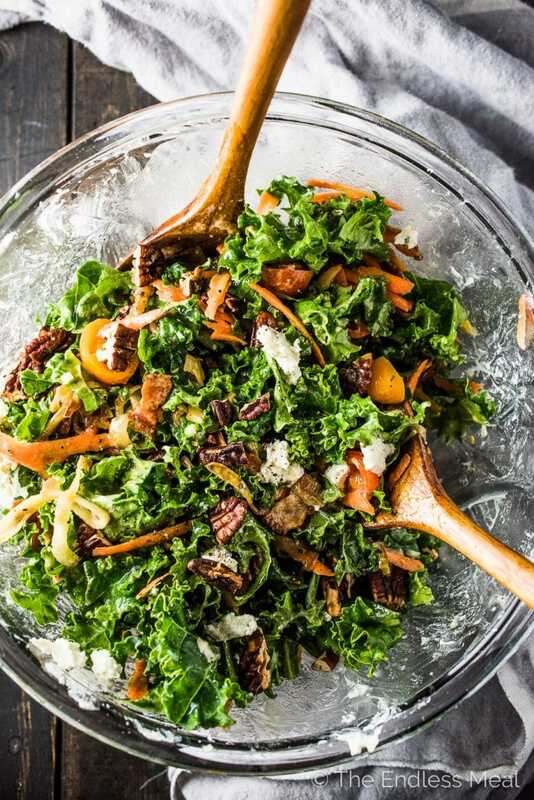 If you love The Best Kale Salad as much as I do, don't forget to give it a 5-star rating in the comments below! In a medium-sized bowl whisk together the white balsamic, honey, dijon mustard, shallot, and garlic. Slowly whisk in the oil in a slow and steady stream. Whisking the oil in slowly will help it to emulsify and become creamy. Season the dressing lightly with a pinch of sea salt and a few cranks of fresh cracked pepper. Preheat the oven to 375. Place the pecans on a baking tray and toast in the oven for 6-7 minutes, or until they are light brown and fragrant. Watch them carefully as they burn easily. Cut the bacon into 1-inch pieces and place them in a large frying pan over medium heat. Fry the bacon for 7-8 minutes, or until it is crispy but not burnt. Immediately remove the pan from the heat and, using a slotted spoon, remove the bacon from the pan. Remove all but 2 teaspoons of bacon fat from the pan Reserve the bacon fat for another recipe – like this one. Add the thinly sliced onions to the pan. Cook the onions, stirring occasionally, for 10-12 minutes, or until they are quite soft and light brown. 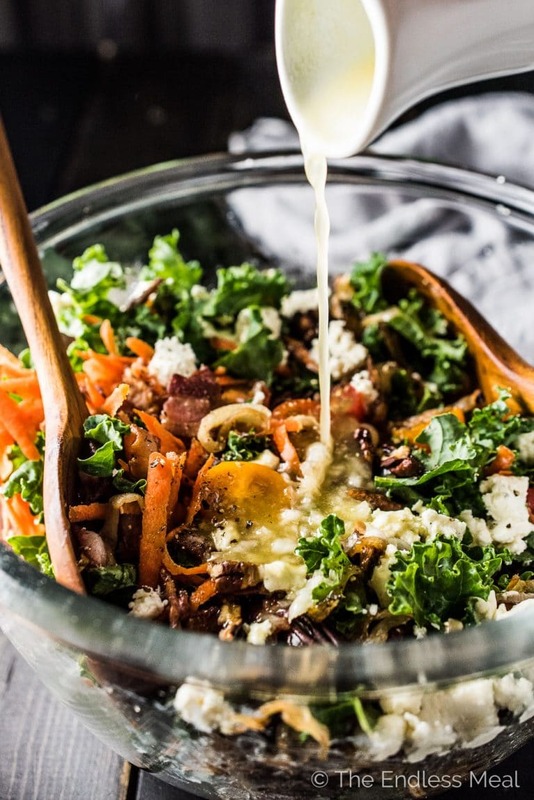 Add the kale, Boursin cheese, pecans, bacon, caramelized onions, carrot, avocado, cherry tomatoes to a large bowl. Toss with the dressing and serve immediately. The best salad!! Taste delicious! I’m so happy to hear you agree! Very good. I probably still slightly prefer a Kale BLT salad, but my wife has a more discreet palate and she said this is the best salad I have ever made. And, our 3 and 5 year old boys each finished a bowl! Eating this now. It turned out really well. I would give it a second name of “cheeseburger topping salad”. Seems to have everything an amazing burger would… aside from the beef and bread. And I definitely thought of cheeseburgers while eating it. yum. Thanks for introducing us to Boursin Cheese! I love it! Might just have to serve it in a burger next time!! Made this salad last weekend and it was just as the name proclaimed. It is definitely THE BEST Kale salad ever. Easy and ingredients I had on hand. There were no leftovers as my husband ate more than half the bowl! I have already made it again and look forward to trying more of your recipes. Thanks for posting so many delicious looking ones to choose from! This was very delicious! I tried it over the weekend and it was a hit! Thank you for sharing this great salad recipe! You’re right … this is THE BEST! I served it with some grilled chicken and it was the perfect dinner. Yaaaa! So happy you agree! i made it last night and its super deli… I will definitely make this again and again. I’m so happy you liked it as much as I do! Mmmmm I’m so hungry all of a sudden. I’m probably the only pregnant woman who’s craving salad 24/7. Beautiful food! Haha I totally get you girl! When I was pregnant all I wanted was fruit and veggies. I spent a whole month eating mandarin oranges like nobody’s business lol. Your body knows what it needs! WOW, This is an amazing recipe! Kale salads are normally a miss for me but figured I’d try this one out because I love all of your recipes and I was not disappointed. Only thing we did differently was throwing a chicken breast on it. Will be making again! That makes me so happy to hear! Hooray for a winning kale salad!! This looks phenomenal! I love any salad based on kale. And that dressing sounds amazing. Can’t wait to try it! I’m so happy to hear you think so, too! I made this salad last night and it was delicious! I have always massgee the dressing into the kale leaves when making kale salads. I used half the dressing and massaged it into the kale, then put all other ingredients, accept avocado on top and covered it in the fridge for about 3 hours. At serving time, I added the avocado and the remaining dressing and tossed it all together. It was fantastic and looks so nice with the colourful veggies. Thank you so much for your comment! Another reader had asked if the salad could be made ahead of time. I had expected that it could, but it is so great to know for sure. Thank you! Could this be made a day or two ahead, without the avocado, which could then be added just before serving? You can definitely make all the components a few days ahead of time but I wouldn’t toss it together until you’re ready to eat it. I have eaten this as leftovers a few days after and it’s ok but not awesome. 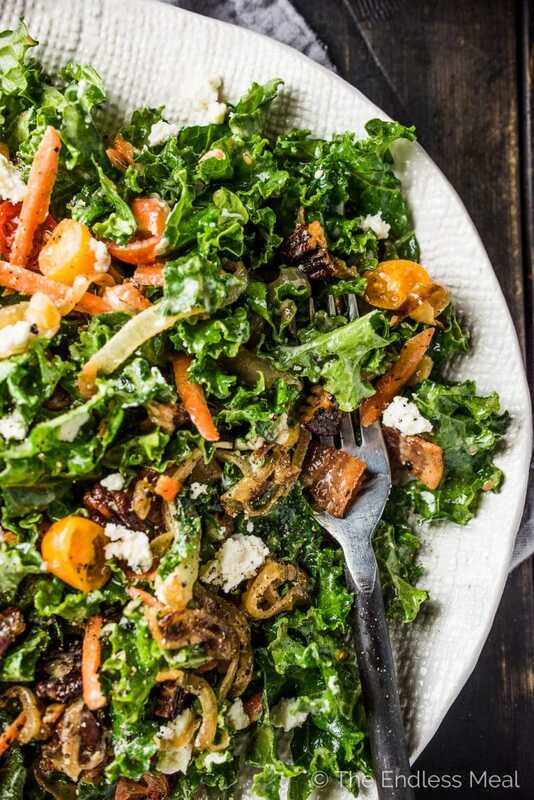 I would recommend making the dressing, toasting the nuts, caramelizing the onions and even cleaning the kale in advance to save you time the day of. Delicious with lots of different textures. I will make this again. So happy to hear you enjoyed this! I finally made this salad last night and it is amazing. It surely is the best kale salad I ever had! Thank you. This looks and sounds delicious! I will definitely try this. I have made many ‘best’ kale salads, only to be disappointed. I hope you love it as much as I do. Let me know what you think once you’ve made it. I’d love to hear your feedback!